There is also the prison colony system, so regrettably abused by France and England. The failure of the prison colony does not lie in its principle but in its application. A sane man will turn mad in French Guiana, even if he be "free." No human being could survive the jungles of Tasmania when natural hazards are supplemented by overlord keepers with shoot-to-kill orders and unhealthy appetites of their own. There is one prison colony which did survive to a remarkable degree. But the word must be whispered as it is today, though first settled by "criminals" the most crime-free continent in the world  which would seem to dispose of the heredity theory. There are more roads to be built, more dams to be raised in these United States than a hundred million men could finish in a thousand years. This implies criminal labor. But is criminal labor to be judged and discarded without a second thought when the conditions under which it is practiced rival French Guiana? Can a man keep his self-respect when he is chained by the ankle to his fellow? When a guard stands near with a gun? When no thoughtfulness is shown to him? And last and most important, when his work is labor, not accomplishment? There is Alaska, a land of great opportunities but seemingly in great need of a population and willing workers. Ah, no, I venture upon dangerous ground. Of course the only system is to wish that the malefactor had never been born. The mere fact that he is born and has grown to mans estate has no bearing upon it whatever. Naturally we actually care very little about who forms the rank and file of organized crime. We dont give a snap of the fingers if our house is robbed or our child kidnapped. 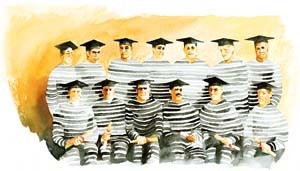 Why shouldnt we board and room and pay the tuition of youngsters in the College of Crime? One small fact, if proved, will have no possible bearing upon the situation: If the number of criminals within our borders has decreased since the formation of the CCC duly allowing for the natural increase in all ranks of crime bred by the humility of relief and the increased need and suffering of families everywhere. No, that would have nothing to do with it whatever. We, the people, plead, beg, demand that the practice of wishing stumbling youth had never been born retain its honorable position upon the unquestionably accurate law books of these great and glorious United States, the land where all men are created equal.